With my daughter at W.O.L.F. 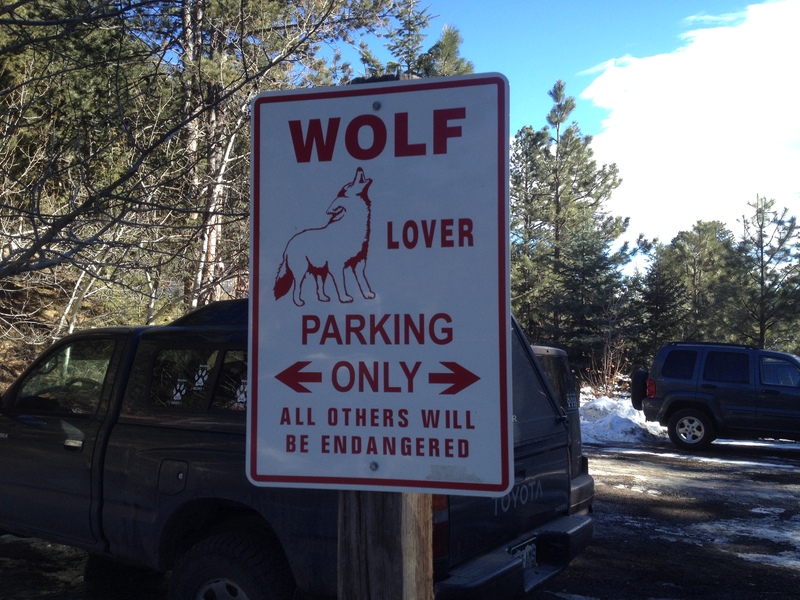 The ride from the flatlands of Greeley, Colorado to the wolf sanctuary in the foothills northwest of Ft. Collins is pretty mundane. It’s a paved zip through the front range red rocks followed by a slower trundle on a dirt road that splits a narrow canyon in right down the middle. Once you get there, everything changes. 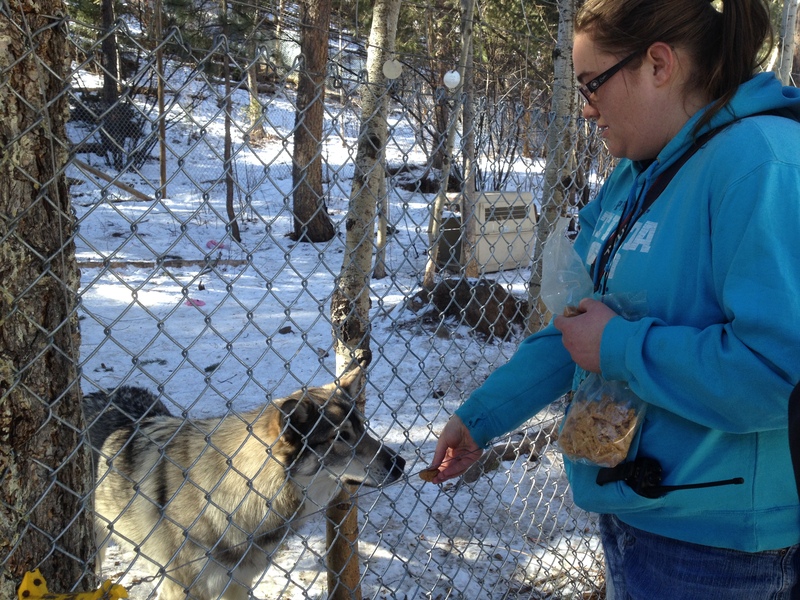 The sanctuary is home to 30 wolves which are mostly wolf-dog crossbreeds. It’s parked on 180 acres of land of which only a small portion can be used per edict of the Larimer county bureaucracy. 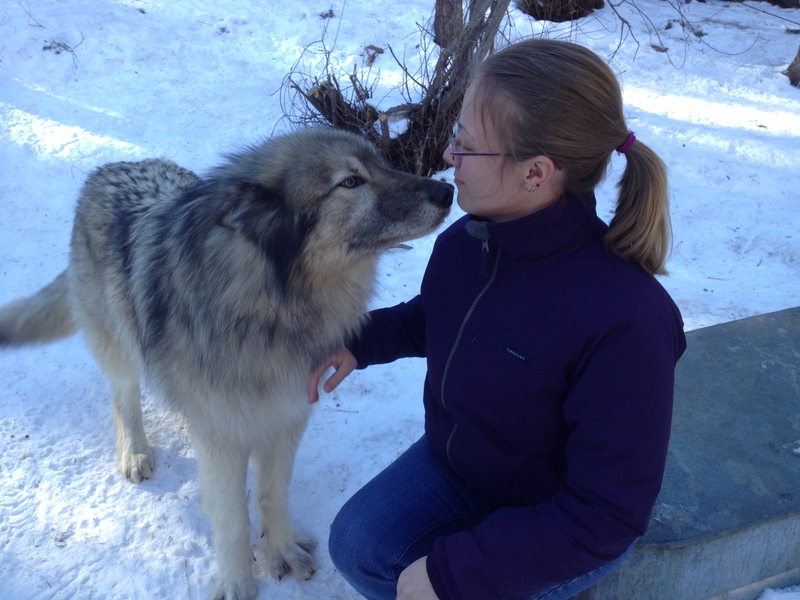 Wolves and crossbreeds that are substantially wolf are distinguishable from ordinary dogs. Wolves eyes are close set, their snouts are longer, and on average they are armed with canine teeth twice as long a those of a large dog. Obviously they need strong canines. If they don’t hang on, they don’t eat. We learned disturbing news. People crossbreed wolves and dogs thinking they’re creating cool pets. They’re gorgeous animals, but guess what? They don’t have the laid back personality of your dog next door. Sanctuaries across the country are full of animals their owners could not handle. My niece brought along some dog treats. The first animals we met were guarded in their approaches, but most eventually succumbed to temptation. 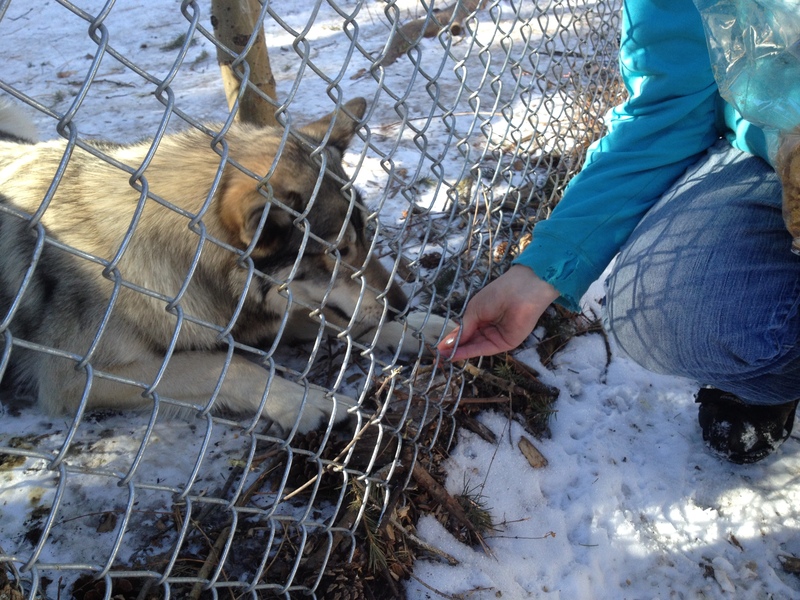 In a couple of cases we were careful not to stick our fingers through the fence. The electric wire is inactive in winter. In summer it discourages bears from raiding the wolves cupboard. The enclosures are one third to one half acre, each with a male/female paring. Seems like the females among them don’t get along with each other all that well. To be honest, the piercing harmony of thirty wolves singing in unison easily ignites primal human instincts. I must say that it was nothing short of awesome. But just as I know that black bears generally fear humans, I’m not sure I’d warm to the thrill of hearing the wolves cry up close while hiking alone! 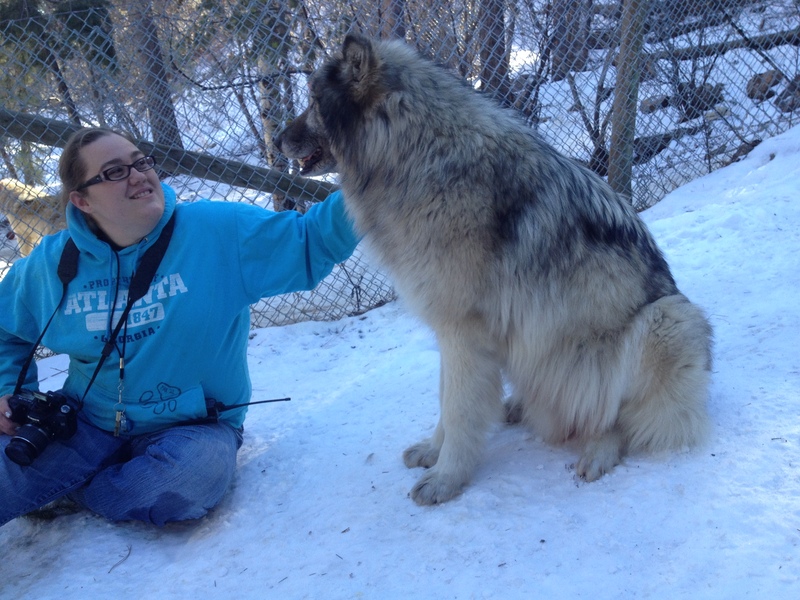 Howling aside, ambassador animals are habituated to humans and serve as community educators to help people understand wolves in general and that crossbreeding wolves and dogs isn’t a bright idea. We got to spend some awesome time inside an enclosure with two of them. My niece has been a volunteer at W.O.L.F. for several years. 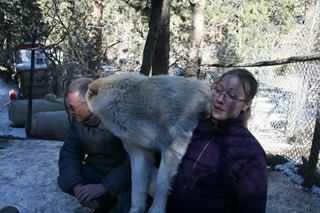 Her posts about and photographs of her beloved wolves on Facebook are informative and fascinating. She’s also exactly half way through law school, and I’m a very proud uncle. Interesting. Nice pictures. 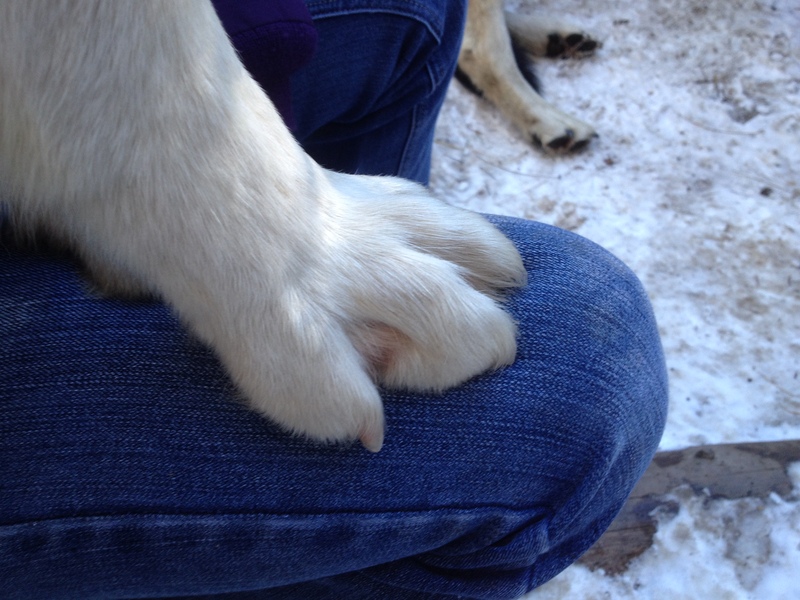 The paw on the thigh was huge. I hope they have continued success with their work. It can’t be easy. Some of these animals are impressively large. They’d even make an impression on a wizard like Harry Potter. They got my undivided attention without doubt. Hi Jim. Good to see you back online. 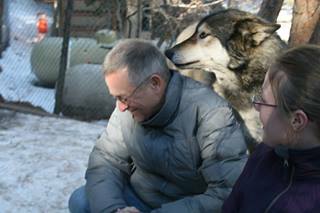 I’ll bet that was a fascinating visit, and yes, it would be amazing to hear the wolves howling in unison. We have plenty of coyotes around here. Now and then we’ll hear a pack start yipping together. Sometimes an emergency vehicle going by with sirens will set them off. Thanks. I still have some personal business to finish before I resume my hike. Will get back at it as soon as possible. Take your time. We’ll still be here.